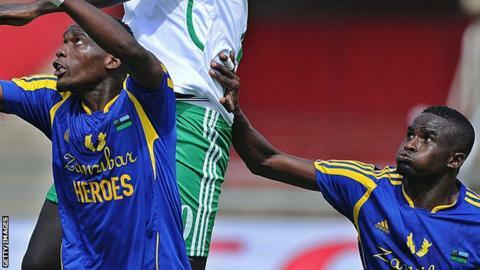 Zanzibar will face hosts Kenya in the final of the Cecafa Challenge Cup on Sunday. Zanzibar ended Uganda's Cecafa Challenge Cup reign with a 2-1 victory over the holders in the semi-final of the East and Central African football Championship in Kisumu on Friday. Zanzibar, bidding for their first Cup in 22 years, will play hosts Kenya in the final on Sunday. The tournament's surprise package took the lead in the 24th minute when midfielder Abdulaziz Makame turned to fire in a loose ball after Ibrahim Ahmada's corner.